A book winner and a pizza finish. It was a fun week reading comments on the book giveaway and tossing names into the dye pot. This book, Designed by You: Ideas and Inspiration for Rug Hookers, by Tamara Pavich [© 2017 Ampry Publishing LLC /presented by Rug Hooking] is so full of ideas and colorful rugs by many hooking artists. I received my RHM Book Club copy of the book, and I’m happy to also have a giveaway copy to send to lucky winner, Naomi Duval. Naomi’s comment reads, “I hope I can get this post to work. Great blog. Great pictures. Like your designs very much.” Thanks, Naomi! I’ll contact you for your mailing address and send this book on its way. I completed my large pizza with a variety of toppings. I finished the piece by trimming the excess linen to three inches and steaming two and a half inches of it to the back of the piece, leaving one-half inch showing all around. I then spot dyed a piece of speckled wool, which wasn’t quite brown enough. 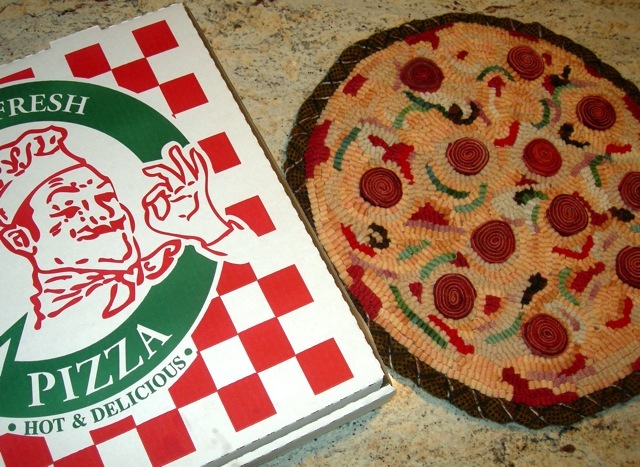 I laid the pizza [face up] onto the backing wool, which I trimmed in a circle about one inch bigger than the pizza . I brought the wool over the edge of the linen and folded it neatly against the row of loops on the front. Basting it in place held it nicely until I could use two strands of wool yarn [one brown and one beige] to crisscross the edge. The beige yarn was too light, so I used a brown marker to color it a bit here and there. I wanted it to be spotty. Now to decide on my next project. 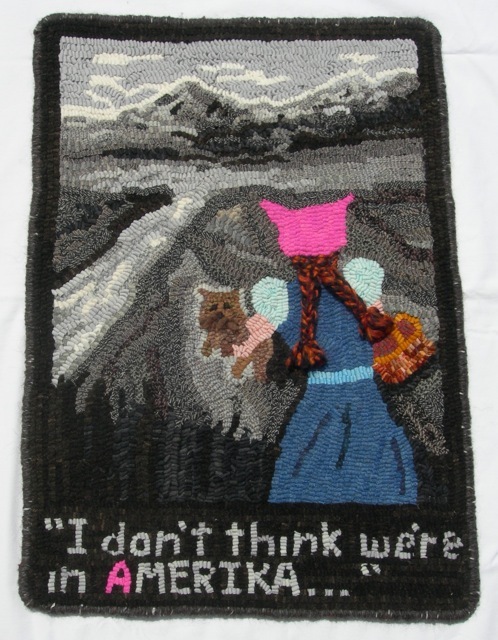 I do want to hook a wall hanging for the back hallway. And I have my super secret project that I have begun. Our weather is very hot and humid, but that doesn’t seem to deter me from working with wool. How about you? I hope you are all hooking and having fun. There’s a lot of beauty out there and in all of our wooly artistic projects. The Zen Pizza is finished!